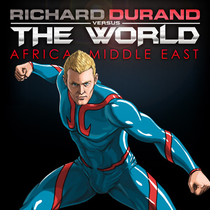 With the first three region EPs already released and the Africa/Middle East hitting download stores this week, ‘Vs The World’ - Richard Durand’s one-of-a-kind, album-in-the-making - is entering its final phase. Step forward South America, your EDM challenge awaits as someone in the region is going to be collaborating with Richard on a track for the album! The journey for the Progressive Brothers, Dennis Sender, Huge Euge and most recently Stefan Viljoen has started. They’ve become the first initiate artists to become co-producers, creating music from the track stems Richard has been placing online since last November. The final regional round of the Richard Durand vs. The World contest opened on August 20th, so head to Richard’s website from August 20th, click ‘Download’ on the App and grab his base track. The direction you take it in from there is entirely up to you - tempo, feel, angle, attitude and atmosphere – it’s all in your hands. Apply your own melodies, FX, vocals, lyrics, bass, percussion and kicks. You can network with other like-minds online to create it: you produce/they sing, vice versa, or whichever mechanic works! Once your opus is complete (you have until September 17th to complete and deliver), head back to the website, click ‘Upload’… and put that meisterwerk into contention! If you win you’ll receive a writing share of the tracks and 50% of the artists’ royalties (which will vary depending on how many co-producers there are). Check www.richarddurand.com for full info.